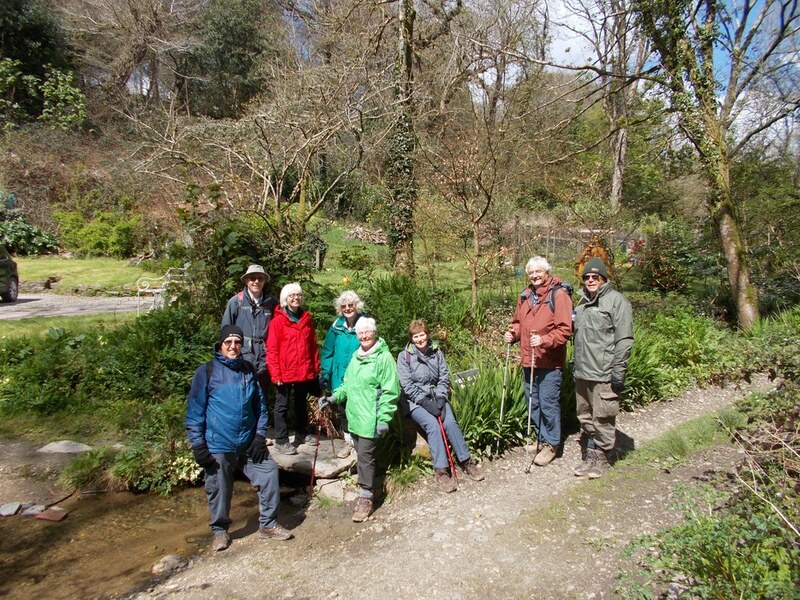 A U3A Walking Group record of 26 including some new U3A members and some who were sampling the group as a prelude to joining met at the main car park at Deer Park-just off the main Looe road from Taphouse- on a wonderful sunny day with just a touch of breeze to keep us cool. This was a walk with a difference in that we had with us a special guide, Martin Summers, who not only had knowledge of the site but was also an experienced botanist. Thanks are also due to Jacob Price, the Retreat Manager at the Centre, who organised the guide and provided a friendly welcome at the reception/café area and a delicious plate of soup for lunch. Setting off through the forest after the introductions we learnt about the various trees, the many grasses and some plants with “rude bits”. Especially interesting was the discussion about the uses of the plants in time gone by from starch replacement to medicines. This site is not only very beautiful but has an interesting industrial history with its black powder works and what were at the time, the richest silver mines in Cornwall. At the end of the main loop we arrive at the village of Herodsfoot which is one of only 51 Thankful Villages in the UK and the only one in Cornwall (the thankful villages are those that lost no men during World War 1). It is in fact “doubly thankful” as it is one of only 14 villages that lost no men in World War 11 either. 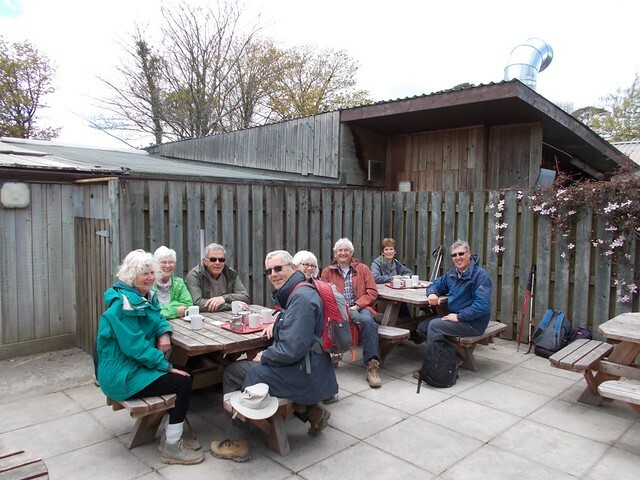 Another walk through woodland and to the Main Reception area and the splendid café for our pre-ordered home made vegetable soup -tomato/red pepper and butternut squash-and very good it was to. One of us, answers on a post card, even had a piece of cake! After lunch Martin told us some of the history of the site and showed us and discussed many of the Edwardian artefacts that have been found in a dump discovered on the site: a site we passed by on our way back. After lunch we also saw what was left of an incorporating mill driven by a water wheel used for grinding the main ingredients of gunpowder charcoal, saltpetre and sulphur. Heading out of the cabin area we crossed the road and walked back to the cars through the forest in the shade and with that pleasant breeze. This brief report does not really do the history justice or all the activities on site that are available to all-holiday makers and local residents. The night time walks, the quiz nights, the café meals-all well worth a visit or re-visit. I am sure that a warm welcome will await as it did for Janet and I on our initial visit to see potential for walking on the site. 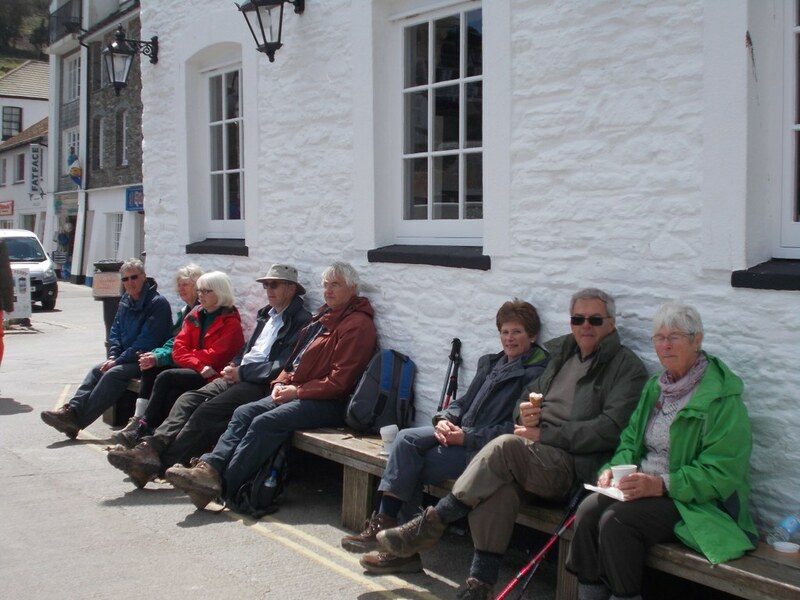 We are away for the next long walk on the 14th June and thanks again to Annie for organising this walk-you will be hearing from her in the normal fashion. 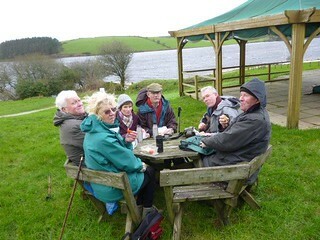 We will be back for 28th June when it will be more like a coffee break and a 3.5 mile easy stroll with great views. to the seaweed next time! NOTES ON WALK ON THE 10TH MAY-A CIRCULAR WALK AROUND RAME HEAD. © Copyright Ruth Sharville and licensed for reuse under Creative Commons Licence. PLEASE LET US KNOW BY FRIDAY 6TH MAY IF YOU ARE ABLE TO COME AND/OR OFFER TRANSPORT. AROUND 4 STILES AND ONE FOOTBRIDGE ON FOREST TRACKS, FOOTPATHS AND QUIET LANES. SILVER MINES WHICH WERE FOR A TIME THE RICHEST SILVER MINES IN CORNWALL. 4)THE TALK WILL ALSO INCLUDE INFORMATION ABOUT THE FASCINATING EDWARDIAN ARTEFACTS DISCOVERED ON THE SITE. ME KNOW BY TUESDAY MAY 3RD LATEST. Although some of our regular walkers were away we still had 9 walkers who set off from the Centre in Lostwithiel in not too bright weather to drive the few miles to the free car park in Pentewan for the start of the walk. 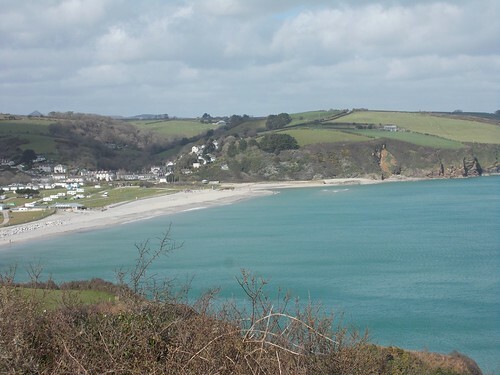 Pentewan, is a very pleasant coastal village and former important port with a harbour that dates back to medieval times when Pentewan was mainly a fishing community with some stone quarrying, tin -streaming and agriculture. At one time Pentewan shipped a third of Cornwall's china clay, but continual silting meant that the port became little used and the last trading ship left in 1940. In fact the harbour is now entirely cut off from the sea. Crossing the B2373 we head uphill on an old cart track passing about 7 old baths,some still with taps, and a home style TV aerial to reach recently ploughed fields and towards Peruppa Farmhouse a Grade 2 listed building constructed in late 18th or early 19th Century. Crossing the road again we walk parallel to the road and through the very well kept Heligan Woods Camping and Touring Park offering a quiet woodland location for camping, motorhomes and caravan holidays and through a gate into the famous and large tourist attraction of the Lost Gardens of Heligan- well worth a visit for any tourist and local as the gardens were rediscovered during the 1990-2000 period and opened to the public in 1992. 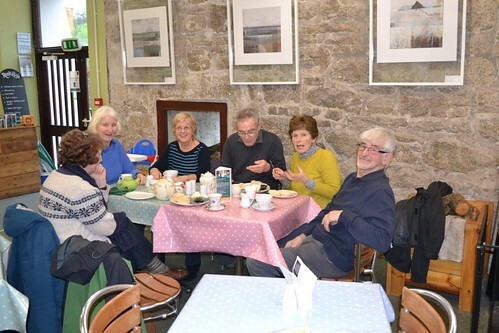 We made use of the facilities and as our walking group likes to do could not resist a treat of a scone or saffron bun or even a large drink covered in cream!-the photograph enclosed shows us in action after the tasting. 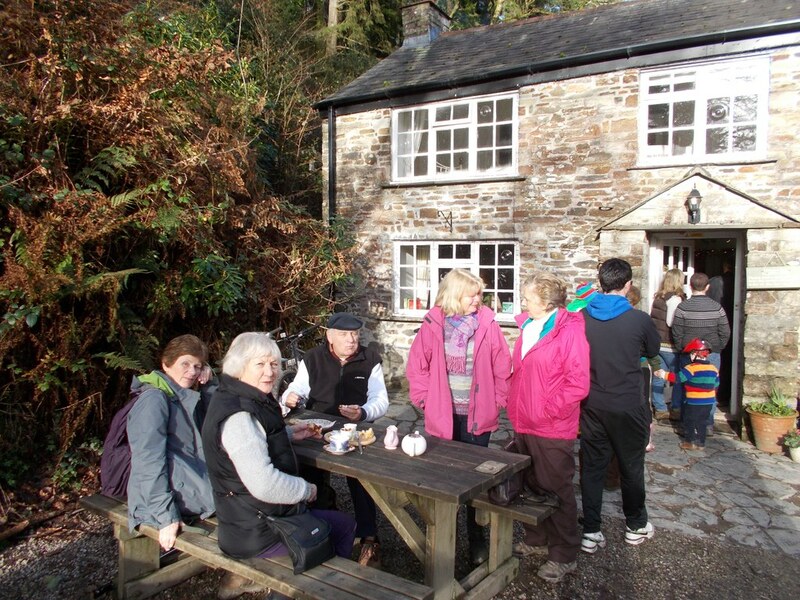 Walking again we head south downhill parallel to the garden and in an idyllic setting with the sun now shining past Heligan Mill and another photograph to show that we aren't always eating in our photographs. Past the sporting facilities in Mevagissey we proceed to the harbour for our proper lunch and sit on a long bench enjoying the sunshine and the views. The name Mevagissey is derived from the names of two saints St Meva and St Issey and the first record is of a hamlet of this name in 1313 but there were local settlements in the Bronze Age. 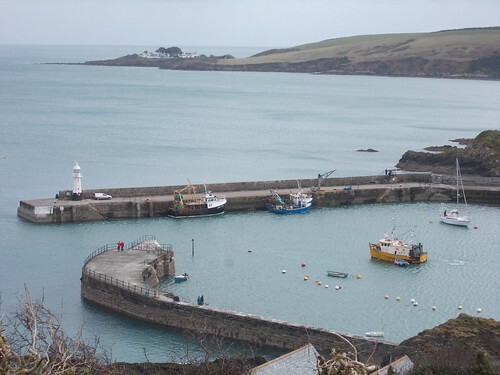 In more modern times Mevagissey was the the centre of Cornwall's pilchard fishery and still boasts a working harbour with a few dozen small fishing boats and residents of Lostwithiel are familiar with some of its catch being sold locally on most Mondays and Fridays. It also has a tradition for boat building dating back to 1745. Leaving the town by the harbour we use the South West Coast path to travel north past Penare Point and Portgiskey to the fine views of Pentewan made famous/notorious by the galloping black horse in the high street banks television advert. We then leave the coast to go inland on a track above the B3273 and gradually descend to a pavement at the entrance to the Pentewan Sands Holiday Park. This five star holiday park is suitable for motorhomes, caravans and tents in addition to the many holiday homes on the site and has many facilities available for residents and non-residents. One last right turn, over the narrow bridge and we are back in the village after our measured 4.2 mile circular route taking in farmland, narrow valley and coastline and at least four opportunities to eat! WE WILL BE MEETING AT COMMUNITY CENTRE AT 10.15AM FOR 10.30 START. Our luck had returned and the sunny weather lasted all day. Not a single Spring shower to dampen our spirits! 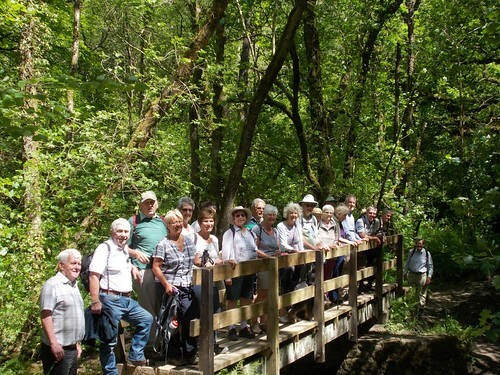 A group of 13 walkers set off from Riverview, Penpol for a 6-mile circular walk. We made our way to Lanteglos Highway, first on the steep road and then we re-joined the footpath at Lawhippet. Having crossed the road at Lanteglos Highway, we looked back and admired the views towards St Veep, Golant and even Lanlivery, as we could see its church very clearly. Walking past Trevecca Farm, we had hoped to see the memorial plaque dedicated to the boys of the Parish’s Sunday School who lost their lives in the First World War. (Mr Pearce Senior had been a steward of the Methodist Chapel and when it was turned into a private residence, he made sure that the plaque was preserved for all to see). Unfortunately, the door to the shed which supports the plaque was firmly locked! However, we had a surprise when walking past the garden of the farm, as it contains an extensive miniature village, including a cathedral! We walked across the fields down to the road close to Trethake Mill and re-joined the footpath along the river down to Pont, before making our way to Pont Pill. The first leg of our walk was over and we had our lunch break in this wonderful setting, partly owned by the National Trust Farm and partly by Hall Farm. For the second leg, we walked on the “Hall Walk” to Bodinnick. Looking back, we saw the tower of Lansallos Church where Daphne Du Maurier got married. From the path, as it was such a sunny and clear day, we got spectacular views of Fowey Harbour, Polruan, the Gribbin and further afield. 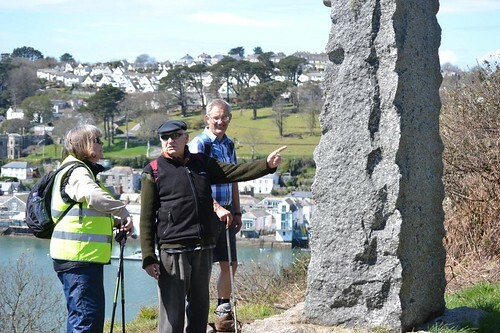 The walk takes you past the granite monument to "Q", Sir Arthur T. Quiller-Couch, great Cornishman, writer and scholar, born at Bodmin in 1863, and died at Fowey in 1944. We decided that we had deserved another break and sat on the terrace of the Ferryboat Inn for refreshments. 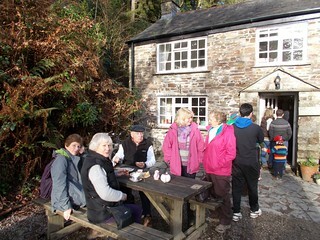 Two of the walkers had a cream tea! Can you spot them in the photo? It would have been tempting to stay on the sunny terrace for the rest of the afternoon but we had to make our way back to Penpol! After a short walk on the main road, we walked on the footpath through Yeate Farm which crosses the drive down to Penmarlham and takes you down to Mixtow Pill. We decided not to walk along Mixtow Pill and to Mixtow and instead made our way directly up to Lombard Farm before finding the footpath down to Penpol across the fields and past a few houses in the hamlet of Colquite. After a short walk along Penpol Creek, we walked back up to Riverview. Altogether, including our 2 breaks, the walk lasted 5 hours. If you like Spring flowers, this is a walk that you will enjoy. We enjoyed seeing carpets of primroses and banks of violets. Early May, these will be replaced by wild garlic and bluebells. C) BRING PACKED LUNCH, AS THERE WILL BE NO FOOD OUTLET! LET US KNOW BY FRIDAY 8TH APRIL IF YOU WOULD LIKE TO COME ON WALK AND/OR CAN OFFER LIFT. WILL MEET AT COMMUNITY CENTRE AT 10.15AM FOR 10.30AM START. I WILL E-MAIL CAR SHARING ARRAGEMENTS IN ADVANCE. Has our luck run out? 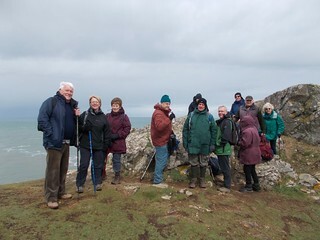 Since we took over coordinating the walking group over 2 years ago we have had to cancel three walks due to bad weather but we have not, until yesterday, got thoroughly drenched. About time I hear you cry. 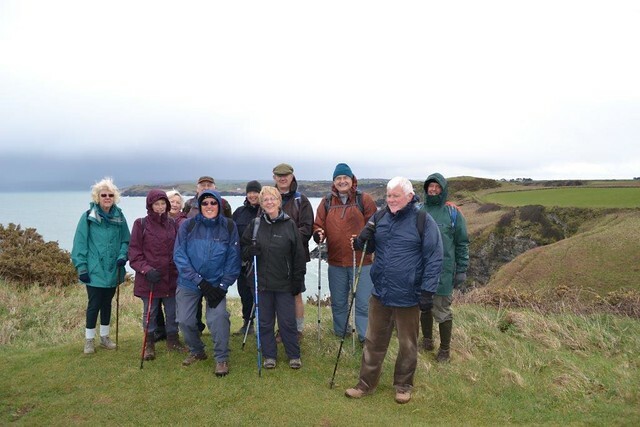 Twelve walkers, including two new members, set off from the NT car park at the old lead mines just beyond Pentireglaze, New Polzeath. For the day after storm Katie the weather forecast was a mixture of heavy showers, light showers, heavy rain and sunny spells with a wind of 25mph blowing from the west so we were, or some of us were, aware that we may get wet and wind battered but we all believed in our Tuesday luck. Our first route took us through the gate at top of car park by the old lead mines and out to a gate overlooking Pengirt Cove. As the weather seems OK we all decide to go onto The Rumps ; two grassy knolls each with obvious paths leading to the top. This is the site of an Iron Age Promontory Fort and was the subject of an archaeological survey and the findings published in 1974 in Cornish Archaeology. 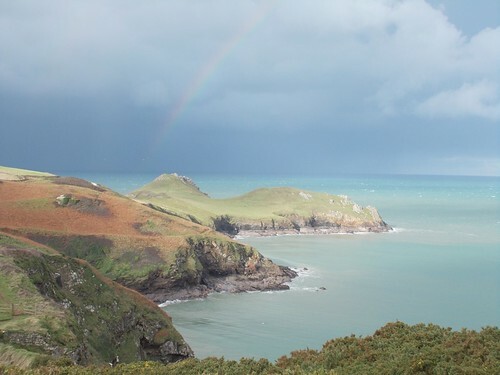 The twin headlands are linked to the mainland by a narrow neck making The Rumps a formidable defensive site. Three ramparts span the narrowest part of the promontory dating from late Iron Age and were once topped by wooden palisades; the earthworks remain clearly visible to walkers. Pentire Point from where views stretch way out across Padstow Bay to the distant Trevose Head. This view was becoming less clear as rain could be seen coming in from the west. As we round Pentire Point , derived from the Cornish Penn Tir meaning Headland, we can feel the full force of the wind blowing us away from the cliff and with views of New Polzeath in the background as we head now inland just as the rain starts to fall and follow a path through a gulley now with water flowing down towards the sea and to Pentire Farm. Turning right at the farm we soon find the car park and try to remove as many wet clothes as we can before heading home with our lunches still intact as we had not had chance to eat anything. We look forward to our next walk on April 12th and the continuation of our lucky Tuesday. A) 3.75 MILE TYPICAL COAST PATH WALK WITH UPS AND DOWNS AND MUD. B) PARKING AT NT CAR PARK NEAR PENTIREGLAZE PL27 6QY. IF YOU COULD LET US KNOW BY THURSDAY 24TH MARCH IF YOU WOULD LIKE TO COME ON WALK AND/OR CAN OFFER LIFT. WE WILL MEET AT COMMUNITY CENTRE AT 10.15AM FOR 10.30AM START. YOUR U3A 2016/2017 SUBSCRIPTIONS ARE DUE-I MAY ASK TO SEE YOUR CREDENTIALS! I AM AWARE OF SOME PEOPLE WHO CANNOT JOIN US ON TUESDAY'S-I WOULD BE HAPPY TO PASS ON OUR WALKS INFORMATION TO ANOTHER GROUP CONTACT FOR THOSE WHO WOULD RATHER GO ON ANOTHER DAY. 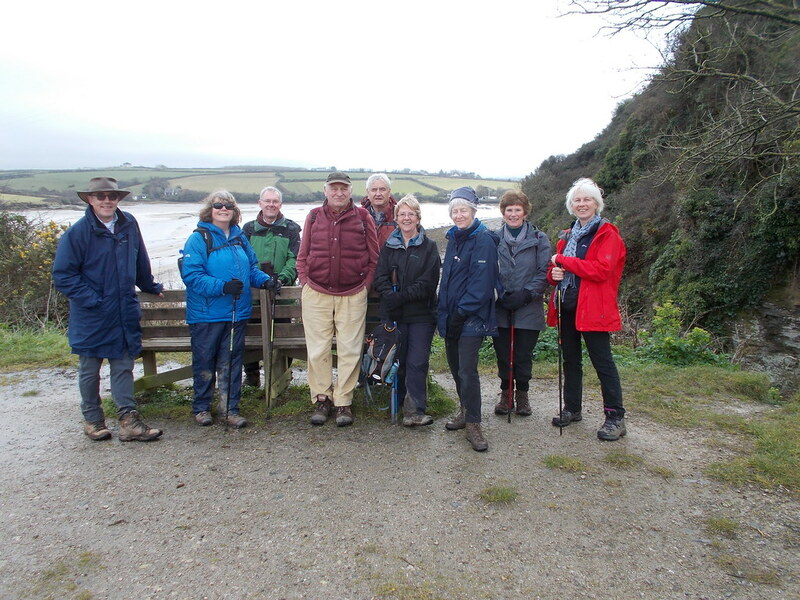 Ten members,including two new recruits from our Open Day, set off from the car park at Little Petherick (only 50p for all day parking) to walk on the Saints' Way to Padstow. 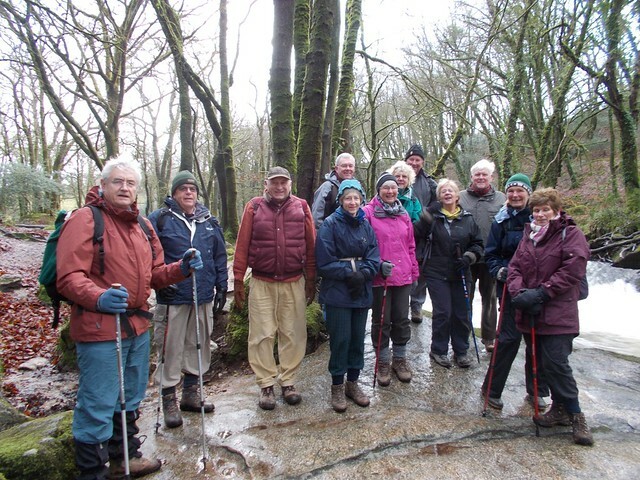 Although there was a hint of drizzle as we left Lostwithiel the weather has brightened a little as we set off walking along side the Little Petherick Creek and then climbed up through a wood and over a stile into fields and a good view of the River Camel. The path was very muddy in places and a few of us had narrow escapes as we nearly fell especially on the downhill sections. Across a boardwalk section as we skirt around one of the many side creeks and up some steps as we again have an excellent view of River Camel. As we approach the obelisk erected to commemorate Queen Victoria's Jubilee we can then go down hill across a field and views of Padstow and the river. We are soon in Padstow and made plans where to meet after our well earned lunch time stop. 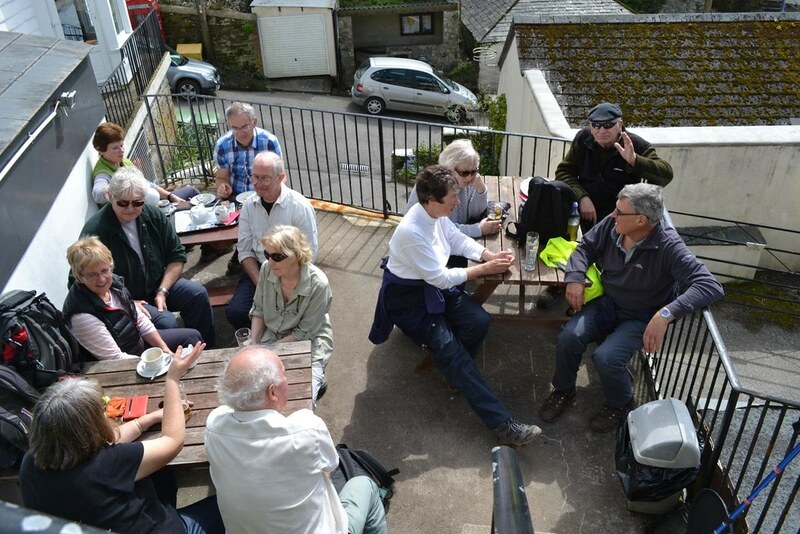 A few of us decided to try the recently crowned World Champion Cornish Pasty from Chough Bakery, others brought their own food and some had some chips and most had a hot drink sitting under cover in theseating area by the harbour. Heading now along the Camel Trail and across the old railway bridge we walk another mile before we turn right near the small car park. The Camel Trail is an 18 mile largely traffic free, surfaced and virtually level multi use trail which provides access to the beautiful Cornish countryside along a disused railway line between Wenfordbridge, Bodmin, Wadebridge and Padstow. The trail is managed by Cornwall Council and the Camel Trail Partnership and is carefully maintained to accommodate a large number of users each year. Its now uphill past the ruins of Halwyn Culver-house. 'Culver' is derived from the old English word for a pigeon and the house was therefore a large dovecote, and parts can still be seen. 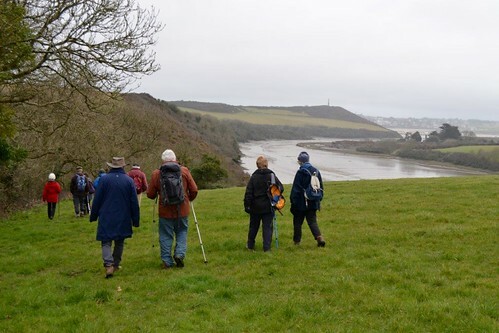 After the climb on minor roads we again have to cross a muddy farmyard and a downhill and then uphill sections with views across to Little Petherick Creek to Padstow. Soon in the hamlet of Trevance and then the village of St Issey with its distinctive parish church which is partly Norman and was enlarged in the 15th century when the tower and south aisle were built. Also in the village and opposite the church is the Ring o' Bells public house which itself dates from the 17th century. Two volunteers were then selected to wear the yellow vests so that we could walk back safely along the A389 and back to the car park. According to the modern devise we had walked 5.96 miles-so our 6 mile prediction using the string and ruler technique had fared well on this occasion. IF YOU COULD LET US KNOW BY FRIDAY 4TH IF YOU WOULD LIKE TO COME ON WALK AND/OR CAN OFFER LIFT. ANNE FOR SETTING UP OUR DISPLAY AT THE RECENT U3A OPENDAY. What a relief to draw the curtains in the morning and to see that the weather forecast was right: we were going to have a dry and sunny day for our walk! 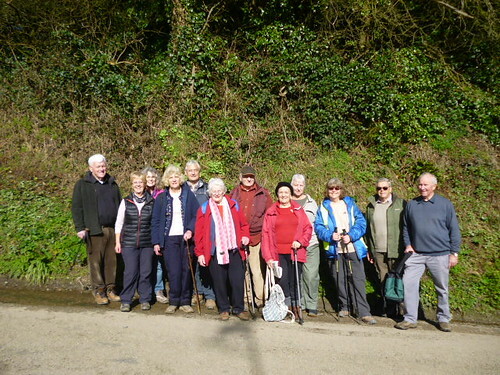 Fifteen walkers drove from Lostwithiel to Penpol to meet up at Annie Singer’s house. flowing fast. The road itself was full of water pouring down from streams and fields. It was obvious that the drains were either blocked or not coping with quantity of water pouring downhill. 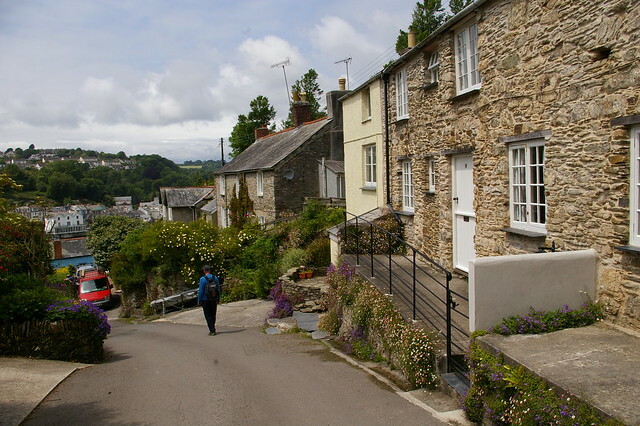 We turned left onto the Lerryn to Polperro road and shortly after we had walked over the little bridge over Trebant waters we turned left to walk uphill past the hamlets of Tencreek and Polgreen. Our group leader had warned us that there would be some short bursts of uphill walking and she was right! 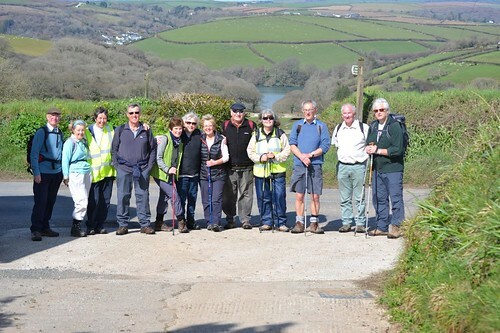 By the time we reached the main road Lerryn to St Veep/Penpol, we regrouped and agreed that by the time we walked back to Annie’s bungalow, we would have done a 2 hour walk and we would call it a day. The walk past Haye Farm to see the cider orchards and catch a glimpse of the Ospreys nesting platform would have to wait another day. The weather was warm (no wind) and we saw lots of snowdrops, as well as a few daffodils and primroses. The lambing season is in full swing, so we saw a few lambs in the fields. We got back to Riverview invigorated by our morning’s exercise and having enjoyed what was for most of the group a new walk! FOR BIRDWATCHERS: WE WILL CATCH A GLIMPSE OF ONE OF THE TWO OSPREYS NESTING PLATFORMS ERECTED RECENTLY BY THE FRIENDS OF THE FOWEY ESTUARY ON HAYE FARM. MEET AT THE COMMUNITY CENTRE AT 10.15 AM FOR 10.30 AM START. If you are intending to attend the walk, please let Annie Singer know by Friday 19th, giving your phone number so that Annie can contact you if she needs to cancel the walk. LET ANNIE KNOW TOO IF YOU ARE ABLE TO OFFER TRANSPORT. Thank you. 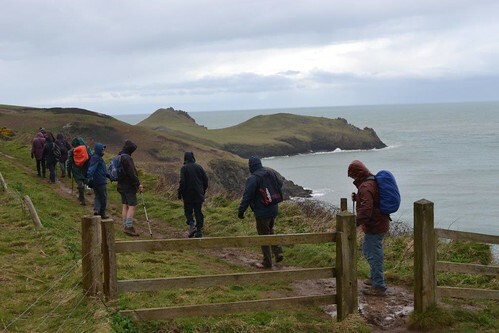 "Five of us had signed up for this walk but in the end I decided to cancel it the evening before: the weather forecast on Spotlight threatened us with wintry showers and more high winds. Not ideal when you are high up on the moors! What a shame! Hopefully, we will do this walk some time soon when the weather is less challenging. Anyway, watch this space for details of the walk on 23rd February! Fingers crossed for dry weather!" 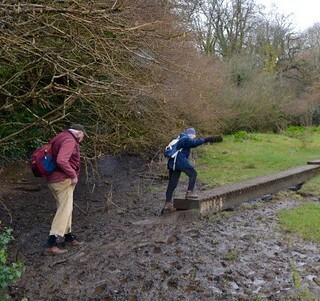 "As you know, finding a walk void of mud this year is proving a challenge. So I do not promise you a walk free from mud! Mud , however, will be limited to a few short patches. See details of walk below. If you are intending to attend the walk, please let me know by FRIDAY 5TH, giving me your phone number so that I can contact you if I need to cancel the walk. LET ME KNOW TOO IF YOU ARE ABLE TO OFFER TRANSPORT. Thank you." OVERALL, THE WALK IS EASY BUT WE WILL NEED TO CLIMB UP TO THE CHEESEWRING (AND BACK DOWN!). WE WILL WALK ON A RANGE OF SURFACES: MINERAL LINES TRACKS, SQUIDGY (but not muddy) MOOR AND FOOTPATHS (SOME A BIT MUDDY). I RECOMMEND THAT YOU WEAR STURDY BOOTS AND BRING YOUR STICKS. WE WILL MEET AT THE COMMUNITY CENTRE AT 10.15AM FOR 10.30AM START. PLEASE NOTE:- BOTH WALKS IN FEBRUARY WILL BE LEAD BY ANNIE AND NOTICES WILL BE ISSUED BY HER IN DUE COURSE. 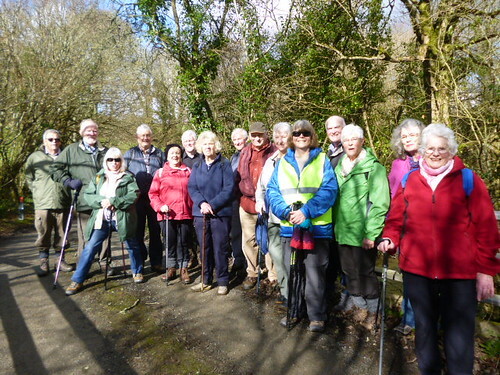 On a cold and windy morning but with the prospect of some sun later in the day, unlucky for some, 13 walkers set off from the Golitha Falls car park to walk the 5 mile circular walk. Just before we set off, however, we had a taste of horizontal hailstones blowing towards us and making us remember our last walk here and the 27C temperatures. The other difference from that day was the volume of water flowing down the River Fowey and making the falls look at their best. Although the river banks were wet we were still able to walk easily to the viewing point and our first photo spot. Retracing our steps back to the bridge we crossover and turn right towards the minor road and then turn left uphill towards King Doniert's stones and an excellent view of St Cleer and the Caradon television mast. The main stones are the granite bases of two late 9th century crosses. The crosses themselves were probably wooden and slotted into sockets on top of the stones. One of them, known as King Doniert's Stone (or in Cornish-Men Myghtern Doniert) commemorates the last Cornish King Durngarth. Durngath (Duncan in English) is thought to be a descendant of the early 8th century King Gerren, and is said to have held court in Liskeard. 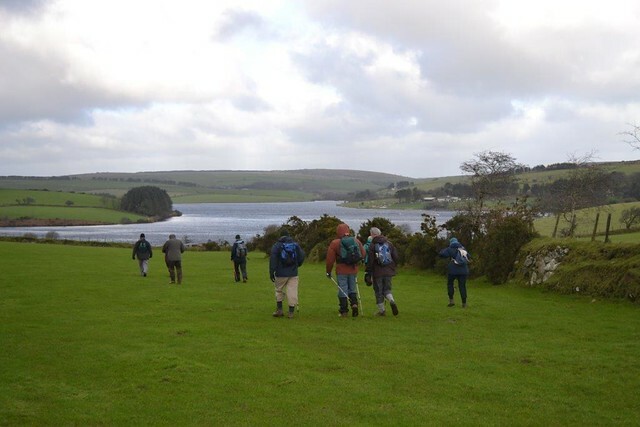 After studying the inscriptions we continued on the road before turning left towards Siblyback Lake, one of South West Water's main Cornish reservoirs and a popular water sports centre and recreation area. Turning left up the footpath just past South Trekeive Farm we sample farmland for the first time but the conditions were sound underfoot we only had to put up with the howling gale which was making us all feel glad we had packed that hat. With a view of the lake we make our way down to the lake side and around the lake to our lunch time stop and a well earned break and some shelter from the wind. 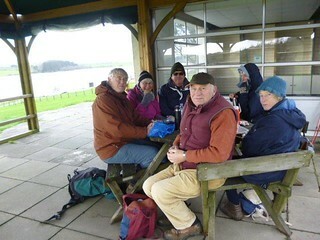 The café is closed for the winter so we just made do with the picnic benches and for some the personal conveniences. The waves on the lake were very evident as we retraced our steps back along side the lake to the dam and then down to the minor road to turn left and upwards towards our starting point again at the car park. We certainly had a breath of fresh air and good company as usual. Thanks to Rob for taking his responsibilities wearing the fluorescent jacket with such aplomb. 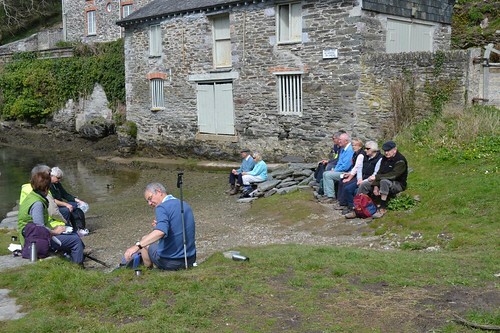 River Fowey at Golitha but uses, in the main, minor roads. B) Muddy in places-a walking stick may be useful if you have one. C) Mainly flat but some steady inclines. D) The cafe is not open in January so a picnic and drink would be handy. We will meet as normal at Community Centre at 10.15am for 10.30am start. 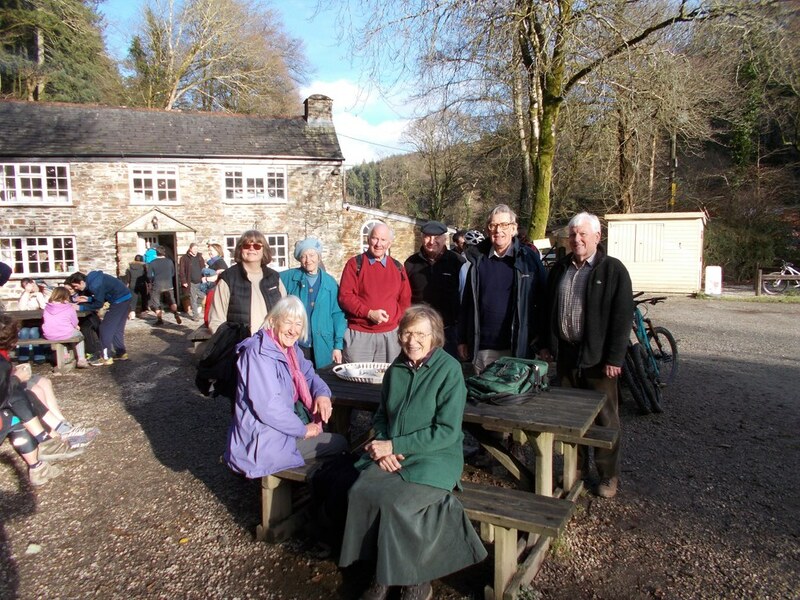 On a DRY, SUNNY AND WARM December morning twelve walkers met at the Community Centre for the short trip to Cardinham Woods and the start of the walk. The weather also had an effect on the rest of the population as the car park was nearly full and there were a lot of cyclists and families taking full advantage of the school holidays and the weather. Our chosen route on the east side of the valley up to Lady Vale Bridge was quiet with few people and good walking underfoot despite the rainfall of the previous days. Past the bridge we turn hard right to climb up a sharp ascent and past some of the tallest trees in the wood to the old silver and lead mine of Wheal Glynn. The old engine house and chimney can still be seen through the woods. The mine was started in the early 1850's and in 1859 it was recorded that 18 tons of lead had been extracted but working seems to have been stopped soon after. In 1864 a proposed reworking of the Wheal Glynn under the name of Cardinham Wheal Rose came to nothing. After the steep ascent with great views over the wood we descend gradually to return to the main path and turn right to cross the Lady Vale Bridge which takes its name from the Chapel of Our Lady that stood beside the river during the 12th century. The river we cross is the Cardinham Water which flows down south to join the River Fowey somewhere near Bodmin Parkway Railway station. We then turn left to walk on the other side of the valley and back to the car park and our destination of Woods Café to replenish the calories we had just lost. The photographs taken only show us at the café but we did also walk!